You are here: Home / Featured / Is the Polaroid Snap a Must Have Item for the Holidays? I love this age of digital photography. Long gone are the days of carrying around a camera as we are able to instantly capture any given moment with our phones. But the one thing that’s lost is having a physical picture to hold on to. Sure we can print out our pictures at home or at the store, but be honest. Most of those pictures that you take are stored on your mobile device or home computer, never to see the light of day. The Polaroid Snap looks to solve this problem. The Polaroid Snap Instant Digital Camera combines the nostalgia of instant photos with modern photography. And with its slim design and reasonable price tag it’s easy on both your pocket and your wallet. I’ve had mine for two weeks, and while it won’t replace my phone’s camera it is a fun addition at social gatherings. Read my review to find out everything you need to know about this new digital Polaroid camera. What is the Polaroid Snap? With the Polaroid Snap instant photos are a click away. If you ever owned a Polaroid instant camera in the past then you are familiar with the product. Not much has changed. Well, kind of. You still click a button, hear the camera do its thing, and then have your photo instantly processed in a matter of seconds. But 20 years later the Polaroid Snap has a few new tricks. The camera has a MicroSD card slot so that you can easily store your photos if you don’t have paper. But the best part of the Snap is the fun and satisfaction of having an actual physical print of your digital photo. The camera uses Zink Zero Ink technology which means that you never need to purchase ink cartridges or ribbon. The paper is embedded with crystals that when heated with the camera’s built-in printer they release specific colors in order to form the image. In less than a minute out comes a 2 x 3 inch photo that is dry (unlike the old Polaroid photos that you had to wave around until they were ready) and smudge free. What You Need to Know Before Buying the Polaroid Snap? The camera has very limited options. There are only 3 color modes in which to take pictures in, which are black & white, color, and sepia (the classic Polaroid picture finish). It also has a photo booth mode that shoots 6 pictures in 10 seconds, and a self-timer for group pics and selfies. There is no LCD screen to preview your photos. You must use a pop-up viewfinder in order to line up your picture. There is no zoom option. This camera is meant for close-up pics. The back of the paper peels off revealing a sticky back. While I don’t place my pictures anywhere as a sticker this is sure to be a popular feature that teens and young adults will love. There is no paper or Micro SD card included with the Polaroid Snap purchase, so be sure to purchase these additional items with your camera. You must have one or the other in order to take photos, but you don’t need both. Once you have the MicroSD card the only item you’ll ever need to buy again for your Polaroid Snap is paper. There is no ink cartridge or ink ribbon to buy ever. At only $99 this is a fun and affordable camera. It also has a respectable 10 megapixel camera. Comes with a rechargeable lithium ion battery. There is a USB port for connectivity. 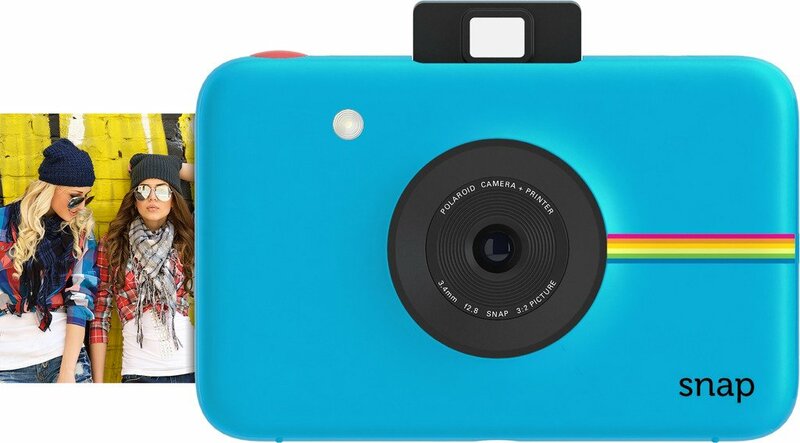 Where Can You Buy the Polaroid Snap? For everything you need for your Polaroid Snap head to these Polaroid Snap Instant Digital Camera Amazon links. There you can find the Polaroid Snap for just $99, as well as the Zink Paper (Premium) for $14.99, and a MicroSD Card (16GB) for only $9.49. All Amazon orders over $35 have free shipping & handling. This Polaroid Digital Camera is a great camera. If you’ve read any other Polaroid Snap reviews then you know the camera’s limitations. It doesn’t take the highest quality photos, and its options are limited. But who cares? Break this camera out at any gathering and it will be a hit. Who can resist having a photo that they can have and hold? And the photo size is fun and convenient. Keep it in your wallet, on your desk, or on your fridge. I had some friends over and left the camera lying around, and let’s just say that all of the paper that I had was gone by the end of the night. I also haven’t had any issue with the battery dying on me. Each charge seems to be good for about 4-5 hours of use. I have a feeling that this camera will be a popular stocking stuffer this Christmas, and I already plan on giving it as a gift myself. The Polaroid Snap will be a welcomed addition to just about anyone’s photography repertoire.